Margin funding is a double-edged sword—while boom times can double profits, busts double your losses. Brokers are ready with margin credit to increase their volumes and at the same time, provide leverage to their customers. Six months ago, small businessman Sunil Khanna began investing in the stock market through margin funding with assistance from his broker. This credit facility paid for a part of Khanna’s stock purchases, while his broker funded the rest to be settled at a future date. The smalltime metal trader’s gamble paid off for a while as soaring stock prices saw Khanna’s returns increase several-fold. Emboldened by his success, he tripled his stock purchases and likewise extended his margin credit. But Khanna’s luck ran out: the stock he bought plunged over 50 per cent in a day, his broker quickly squared off his shares without intimation to avoid further losses, and Khanna ended up with dues that wiped the entire gains he made since he started investing through margin funds. Khanna is one of many who have tried margin credit and have not been successful. Margin funding is not always a win-win situation as it might appear for most investors. Brokers are ready with margin credit to increase their volumes and at the same time, provide leverage to their customers. Yet, margin funding works best for the investor when the market is in a bull rally, providing them with a two-fold return. 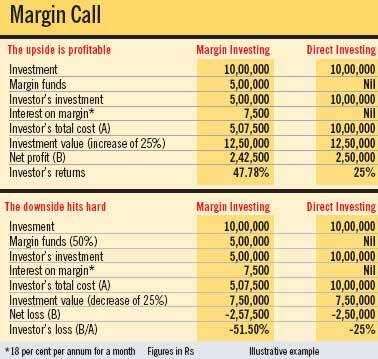 In the grip of a falling market, margin funding can prove disastrous. Margin credit was introduced to attract more investors to the stock market, particularly those who were short on investments. The move stoked the volumes, tended to reduce the extent of profit booking and also helped expand the size of the market. Brokers offer 50 per cent initial margin to certain specified securities and generally maintain a 40 per cent margin after you have bought a stock. In case the stock tumbles 10 per cent, a buyer has to provide more collateral. But when there’s a sharp downswing triggering a free fall, most brokers dump the client’s stock to cover positions and investors face big losses. Consider this: Company A’s shares are trading at Rs 3,000 and you wish to purchase 100 shares, for which you would normally require Rs 3 lakh. However, margin funding allows you to buy these shares for Rs 1.5 lakh. When you sell, say, as the scrip hits Rs 3,500, your returns work out to 33 per cent as you make a profit of Rs 50,000 on your investment of Rs 1.5 lakh. On the flip side, had you invested the entire Rs 3 lakh, the Rs 50,000 profit returns a mere 17 per cent. Many investors are trying to increase their returns this way with easy credit options. “There is, of course, the advantage for the investor to carry his position in the cash market at half the price, but if the market swings wildly in the negative on a given day, the investor could lose more than half his investment,” warns Gagan Banga, CEO, Indiabulls Security Services. However, consider in the same above example when the share price drops to Rs 2,500. On an invested capital of Rs 1.5 lakh, an investor loses Rs 50,000, wiping out 33 per cent of his gains. If the price drops more than 50 per cent, which is a possibility, an investor stands to lose his entire capital. In both the above examples, the interest component has not been factored in the calculations. Brokerages charge anywhere between 15 and 20 per cent per annum on the amount they fund you. Some brokers are known to charge higher rates, making it more expensive for your trades to turn profitable. That’s not all. In case a stock is seeing wild swings, the broker will ask you to fund your account with more investments. “Apart from the interest cost on the money borrowed, brokers will sell the shares to recover their money if they feel that the investor may not be able to cover his position in a bear-grip or does not provide further collateral,” says Kapil Krishen, CFO, India Infoline.